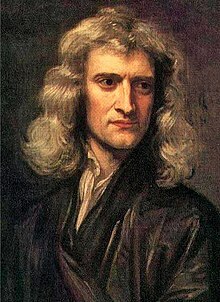 Sir Isaac Newton FRS was an English physicist and mathematician who is widely recognised as one of the most influential scientists of all time and a key figure in the scientific revolution. His book Philosophi� Naturalis Principia Mathematica , first published in 1687, laid the foundations for classical mechanics. Newton made seminal contributions to optics, and he shares credit with Gottfried Wilhelm Leibniz for the development of calculus.